Iran has unveiled a new long-range missile among an array of armaments displayed in an annual military parade commemorating the country's 1980-88 war with Iraq. The missile, known as the Ghadr - meaning power - has a 1,800km range, officials say, putting US military bases in the Gulf within range. "Brotherhooad and Justice" indeed. 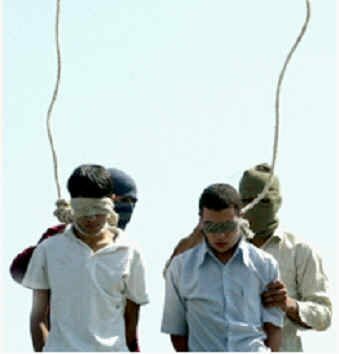 Below is an example of Iranian justice - four men hanged because they are homosexuals.